It's a gray gloomy day outside my window. I have a problem. You see, I love toppings. All those self-serve frozen yogurt places that are all the rage (is it cool to say all the rage?) right now are dangerous for me. Topping and toppings galore! My frozen yogurt doesn't always turn out too great because I over "top" it...but oh the fun! So I was making these cookies and adding whatever I could find in my pantry, totally delighted with all the possible "cookie toppings"... when...Bradley stopped me, reminded me of my problem and complained about having to go to the store to by "normal" cookies. So the end results is simply: Oatmeal, Raisin, Cranberry, Chocolate chip cookies (the cherries, walnuts and coconut were intercepted). They are delicious (and Bradley didn't have to go to the store to by any cookies). Preheat oven to 375. Beat butter, sugars, eggs and vanilla extract until well blended. In a medium bowl combine flour, baking soda, salt, cinnamon and nutmeg. Add dry ingredients to butter mixture, stirring just until combined. 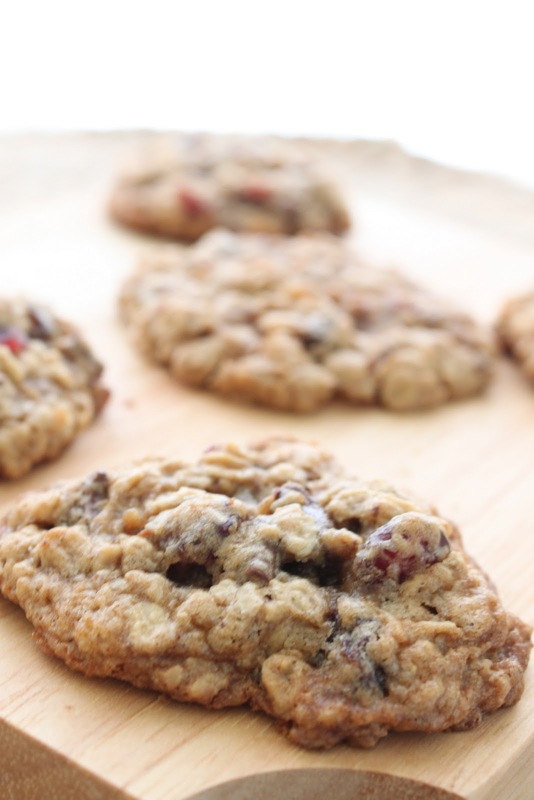 Fold in rolled oats, raisins, cranberries, and chocolate chips. Drop dough by rounded teaspoons about 2 inches apart onto a cookie sheet. Bake for 8 – 10 minutes, or until edges are lightly browned. Cool 2 minutes and remove to wire rack to cool completely.